This week, CWA filed unfair labor practice (ULP) charges against AT&T and NABET-CWA employer Nexstar Media Group for refusing to provide information about each company's plan to use its tax windfall to invest in its workforce. Before the Tax Cuts and Jobs Act passed, AT&T promised that corporations would use their massive gains from the bill to raise wages and create "7,000 good jobs for the middle class." Instead, just days after the tax bill became law, the company announced more than 1,500 layoffs, and has continued to stonewall workers fighting to protect U.S. jobs at the bargaining table – despite receiving $20 billion as a result of the tax bill. The charges are the latest escalation of efforts to hold corporations accountable at the bargaining table for the tax bill promises they made. In recent months, CWA and other unions have filed information requests to find out if increased corporate profits from the tax bill are really going to raise wages and create jobs. Piedmont Airlines and Envoy Air Passenger Service Agents from across the country gathered in Washington, D.C., to share their stories with Congress and to ask for support in their efforts to win living wages and fair contracts for the 9,000 passenger service agents who service flights for American Airlines' wholly-owned subsidiaries, Piedmont and Envoy. 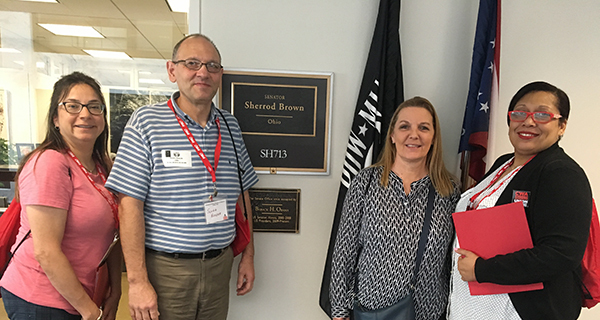 Darryle Williams, a passenger service agent who has worked for 11 years at Piedmont Airlines in Charlotte, N.C., said, "The visit to the Senate and House was very effective. It gave us a chance to give a personalized account of what really happens at Piedmont and what type of working conditions we're under – from not receiving livable wages to 60 to 70 hour work weeks. We have a food bank at the airport for people who work full-time and don't have enough money to buy meals. We're not asking for wages that are going to take people into another income bracket, we're just asking for livable wages." American pays a living wage to "mainline" passenger service employees who work under the American name. However, workers at Envoy and Piedmont – who wear the same uniform and do the same work as those at American, but fly under the "American Eagle" banner – earn poverty wages, with few possibilities for increases. At Piedmont, pay starts at $8.50, and at Envoy it starts at $9.48. A recent survey of 900 Envoy agents found that 27% must rely on food stamps or another form of public assistance to get by. Nau Lavaka, a passenger service agent of 11 years at Envoy in Dallas, Texas, said, "We want American to be fair and pay Envoy and Piedmont workers a livable wage. We all work side by side in the airport with American Airlines workers. I love my job, that's why I've been there so long. When I first started 11 years ago, the starting rate was $9.00. It's 11 years later, and the starting rate is $9.48, it only went up $.48." Passenger service agents at Piedmont and Envoy do everything from managing pre-flight checks and guiding planes on the tarmac to helping passengers re-book their flights due to weather. To passengers, Piedmont and Envoy passenger service agents are the face of American Airlines. Meanwhile, American Airlines CEO Doug Parker recently told CNBC, "I don't think we're ever going to lose money again." American earned $1.9 billion in profits in 2017, and its profits are expected to rise even higher in the next few years as a result of the recently passed Republican corporate tax cut bill. Envoy workers are more than two years into efforts to win a first contract, and its bargaining team is set to return to negotiations with the company at the end of May. Piedmont Airlines workers are about to send their bargaining team into mediation with the company after a year of negotiations. 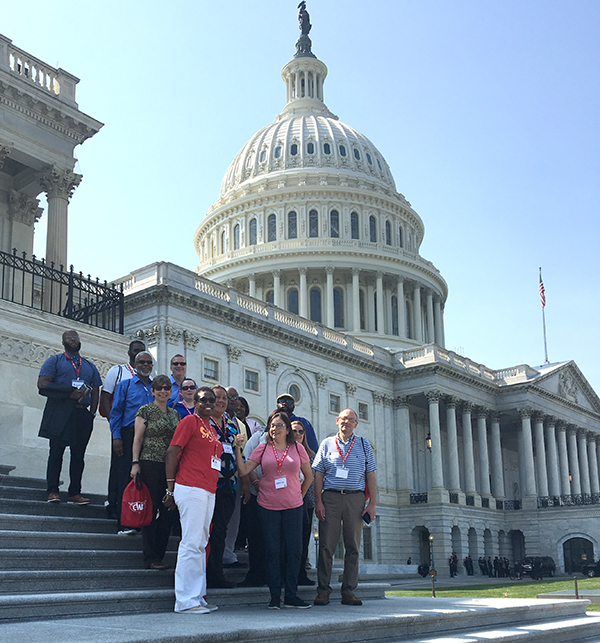 Piedmont Airlines and Envoy Air Passenger Service Agents from across the country gathered in Washington, D.C., to share their stories with Congress and to ask for support in their efforts to win living wages and fair contracts. Below, left to right: Envoy agent Martha Chentis of Chicago; Envoy agent Scott Hosler of Toledo; Envoy agent Susanne Skowronski of Chicago; American Airlines agent Ingrid Paredes of Miami. This week, the Louisiana State House passed a CWA-supported bill by a vote of 83-8 giving the state the ability to claw back tax incentives when corporations don't keep the employment promises they make. The bill has already passed the State Senate on a unanimous vote, and Louisiana Governor John Bel Edwards is now expected to sign it into law. The bill, introduced by Louisiana Senator Troy Carter, was spearheaded by CWA members in order to crack down on call center employers that utilize state tax dollars and then move work out of state. CWA Local 3411 president Matt Wood testified in March before the Senate Revenue and Fiscal Affairs Committee in support of the legislation. 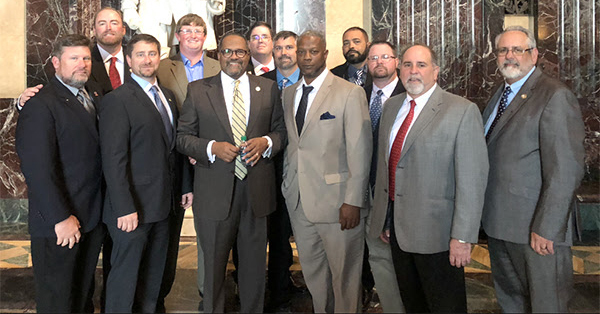 In March, CWA local presidents from across Louisiana gathered at the State Capitol in Baton Rouge to meet with Louisiana Senator Troy Carter (front, third from left), who introduced a bill to crack down on call center employers that utilize state tax dollars and then move work out of state. Beginning this week, CWAers and retirees are joining tens of thousands of people across the country to participate in nonviolent direct actions to fight back against the structures that are undermining our democracy and supporting economic injustice. 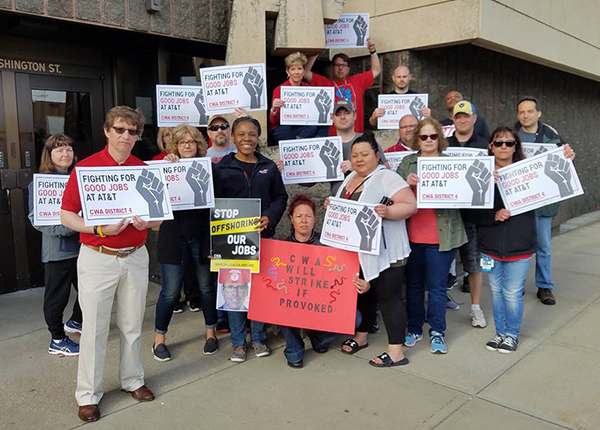 CWA members rallied in cities this week including Columbus, Ohio; Trenton, N.J.; and Washington, D.C., where CWA Secretary-Treasurer Sara Steffens was arrested along with other activists, including the co-organizer of the renewal of the Poor People's Campaign, Reverand William Barber, II. "The challenge that the Poor People's Campaign puts before us could not come at a more critical time," said CWA President Chris Shelton. Over a six week period, actions will focus on and highlight a different set of important issues. The 40 Days of Moral Action will culminate in a mass rally in Washington, D.C., on June 23rd. June 23 – Global Day of Solidarity and Sending Forth Call to Action Mass Rally in Washington, D.C.
Click here to learn more and sign up for events in your area. 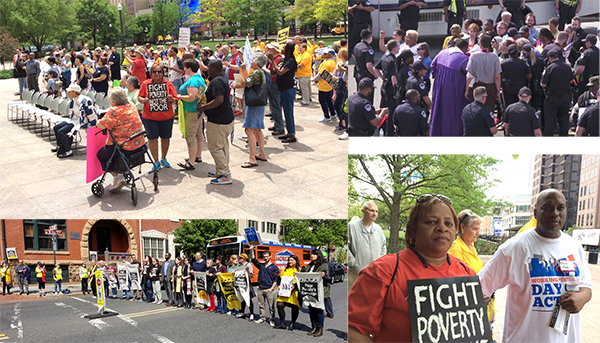 CWAers joined the Poor People's Campaign in Columbus, Ohio (top left and bottom right: Diane Bailey, President of CWA Local 4310 & Chair of CWA's National Committee on Civil Rights and Equity; Kevin Kee, President of CWA Local 4501; Mark Stansbury of CWA Local 4502); Trenton, N.J. (bottom left); and Washington, D.C. (top right). 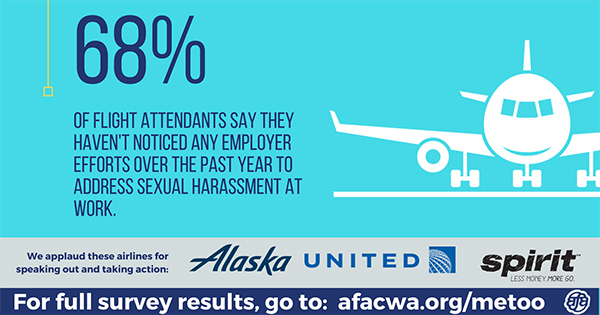 More than one in three Flight Attendants say they have experienced verbal sexual harassment from passengers, and nearly one in five have experienced physical sexual harassment from passengers in the last year alone. Despite the prevalence of abuse and the emergence of the #MeToo movement, 68 percent of Flight Attendants say they saw no efforts by airlines to address workplace sexual harassment over the last year. "While much of the coverage of the #MeToo movement has focused on high-profile cases in the entertainment industry and politics, this survey underscores why AFA has long been pushing to eradicate sexism and harassment within our own industry," said Sara Nelson, AFA President. "The time when Flight Attendants were objectified in airline marketing and people joked about 'coffee, tea, or me' needs to be permanently grounded. #TimesUp for the industry to put an end to its sexist past." AFA-CWA is calling on the entire airline industry to step up to combat harassment and recognize the effect it has on safety.